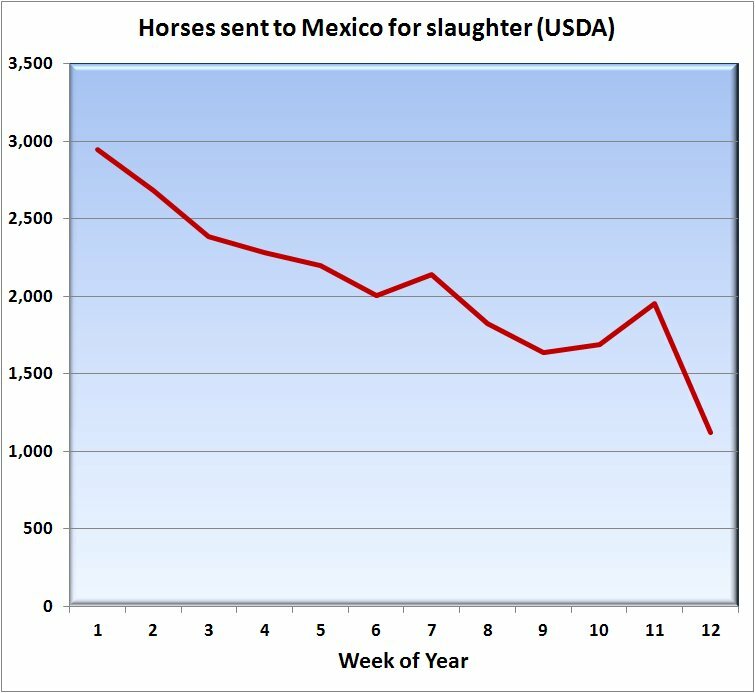 EWA (Chicago) – USDA data for the first quarter of 2013 indicates a precipitous drop in the number of horses going from the US to Mexico for slaughter. The flow of horses south had been increasing steadily for over two years but dropped 62% between the first full week of 2013 and the end of the first quarter. Since the closing of the US based horse slaughter plants in 2007, US horses have been going to slaughter in Canada and Mexico for consumption in the European Union (EU) and Russia. Beginning in late January of this year horse meat began to be detected masquerading as beef in countless products across Europe and much of the world. The resulting scandal was dubbed “Burger-gate” for the fact that horse meat was first detected in Burger King “all beef patties” in England. The EU scandal also explained another mystery. The available data indicated that the consumption of horse meat in EU countries was flat to down over the past decade, but the export of US horses kept climbing. The current trend does not bode well for fledgling companies trying to bring slaughter back to the US since they will be competing with multinational conglomerates in what appears to be a rapidly shrinking market. Data on the export of horses to Canada for slaughter will not be available for 60 days, but reports in the Canadian media indicate an even more severe drop in the number of US horses being slaughtered in Canada. The export of horses to Canadian slaughter had already been on the decline in 2012 when it dropped by 7.5%, but this was more than offset by a 61% increase in horses going to Mexico. The reason for this shift to Mexico is thought by some to be attributable to the fact that Mexico does not test for phenylbutazone contamination, an issue that has plagued Canadian slaughter plants. This is the one market that I enjoy seeing declining! This market is not diminishing fast enough. My concern has always been about the Wild Horses and Burros because they are not given any medications and their systems are clean. The wild ones do get vaccinated which may help keep them off the plate. EU won’t except wild equines except zebra. Wild equines are given meds that make them exempt from HCHS…but that didn’t stop the cretin Davis, with BLM cooperation. BTW, when a wild equine is sold or adopted, even though DOI is supposed to follow up the wild equines become private property….and evaporate into the “private ownership” pipeline. I went to holding pens in Presido in Mid February 2013 and they were empty that weekend. The following week a journalist had 18 bullets put in him. This is what is coming down to. The greed, money, corruption, the violence and the horses going to slaughter. We need some serious help here. What journalist was shot? Do you have a link to this story? Thank you. The journalist killed, was across the border from Presidio. He reported on corruption, drugs, and bad politics…….murdered for taking pictures. Dangerous occupation in Mexico. The work of the horse meat mafia? Anyone have a comparison between first quarter 2012 and first quarter 2013? That’s what I have been preaching from DAY 1 of the scam of the high numbers of horses going to slaughter in 2012. These polls that they run in other countries on trends in foodies and people who reside in those countries were stating they are eating less and less horse meat-that was in 2012, the French who used to be widely known for eating masses of horse meat-its stated they actually only have 2 percent of the country consuming, Wallis wrote a tiny quip about that and make 2 percent sound like a lot, look at the overall size of the country and then chip off the total of 2 percent, it’s really not that much, then the poll showed they have 1 percent who are only being adventurous which leaves the other 1 percent consuming some of it for dinners out or such. The pro-slaughter people in those countries try to BeEf ? the numbers up by making it appear as though its being consumed-the reason? There are people in EACH country attempting to make money off of it. Now with the scandal having broke, they are claiming sales are at an all time high-one place claimed horse burgers went up of 100 percent. So an intelligent journalist inquired how many the diner seated…15 people maximum, then he asked how much foot traffic? lunch/ dinner average 35-60 people daily. The he asked what was served before the scandal-none….then he asked what did they make and serve? Horse burgers….how many have they sold…10 burgers….in three weeks and they were very pleased, however, the journalist was not. It seems many places are attempting to gain free national press and headlines to boost interest in their eateries. Needless to say, they can quote they have it, they can quote they sell it, but many places have no proof anyone is consuming it. He did find a grocer who was selling a bit more, he quoted him as saying that it was just one time consumers purchases, he stated that he received complaints the meat was tough and has since seen another decline in the meat sales. So when you READ all the articles thoroughly you find the truth is there all along. The push to sell horses to slaughter was completely fabricated by pro-slaughter people all along within the US. The practical idea behind this mess was to completely convince the American public see we have an overage of animals, we are in dire straights, to prove in documentation to the Congress members that there is a really strong demand for this meat and its hard to deny the facts. That way the people that stand in their way will have the facts-look they are just demanding so much of this meat! However, the staging of this started to crumble as greed filled killer buyers were getting tired of driving and cutting into their profits and running up mileage to go to the Canada and Mexico borders with horses, so they were pushing the pro-slaughter people to step it up-in doing this they began to leak out this information in 2012 what the plan was to PUSH horses out of the states. Now I do not know where the executive order for all killer buyers came from originally but the statement a killer buyer made to another killer buyer at our local kb auction in Indiana was they were to step up the pressure to obtain horses by any means necessary in order to make the last big push. In other words, they needed to get numbers up in 2012 to have the USDA and GAO reports reflecting the horses we are pushing out of the country, then we can sit back and relax in 2013, gather, stockpile horses until the plan is in play in US. That is exactly what was stated, I now realize the full scope of this situation and major news sources need this information to print it and get it to Congress. These deceptions are the exact reason Slaughter should never occur, its not the option we need for US horses. And then we need to turn the focus to the AQHA being that it boasts of 2 million foals born in the US in 2012-if this it true and they are in control of their membership as they seem to speak pro-slaughter for it, we need to get some legislation since they are the most overbred, quarter horses are bred like crazy. And its NOT the back yard breeders that are the issue in fact, many of the largest production farms, buy mares each season to add to who they bred already and throw out the ones they don’t want and start the cycle year and after year, some farms produced 2000 foals or better just from shipping AI. This needs brought under control, so we have a place to start. Many other registries, including Appaloosa the breeders just took it upon themselves to shut down breeding for several seasons just to slow the numbers down, it also brings the prices up on the stock that is born, because there are fewer of those bloodlines. But the trend of horse meat sales going down was not only inevitable, but most of the reason for the incredible push to get these plants open, cause once they are opened they probably theorized they would steadily ride this bump in the road out and then start the push again, only I am afraid that it may have included the US. Wallis seems to have a fixation on giving this meat to the poor, to schools, and to prisoners. So I cant imagine what kind of fruit cocktail we would have if this had been rammed through several months ago when they wanted it all rammed through. I hope the facts keep spiraling out of control downward. Couldn’t have come at a better moment. Sorry so long-I am just furious! I have a 9 year old horse I sold 5 yrs ago to a reputable man and found the horse impaled on metal that was left when the guy cut the bars out the horse stalls to replace them. He left to get something from the barn and I arrived at his place to find the horse impaled, bleeding profusely, I called help and my friends and I saved him, I prayed to God for miracles, and we got some, the man said just put him down it cost to much to mess with this he said to the vet. I sold the horse for 6500 show quality app, bred to ride, nice horse-so I asked what did he want for the horse and he said the vet bill paid so I turned to my vet, he read my mind and said 300 bucks, I told the guy get in my truck console, get the cash, sign the transfer on the dash, leave papers in truck. He did, I took horse to Purdue, a month in a sling, major surgery, several months to learn to walk again, more time, then he contracted lepto and survived! That was a miracle! Now he’s my 4 yr old son’s riding horse. I am angry at slaughter saying that injured, useless, unwanted horses should die. My best baby sitter, childhood companion for my son, calming agent for other horses, leader to the sheepish, and follower to brash, is a horse that reads people so well, that when he reacted the new horseshoer the other day, I got on internet and googled the guy and then asked him if he was arrested for animal abuse in Kansas, he had been, I asked him to leave and praised the horse for reading the guy. I want this slaughter garbage to stop! A final note my two best show horses were highly untrainable animals that everyone feared before I got them, one a stallion I trained into a 16 hand leopard Federated Dressage Horse! And the mare was a destructive filly, who injured herself and she did hurt others, but I got her and with determination and skill we turned her into a dressage horse, who also won Western Pleasure Championships, was a on television 3 times, could cut calves with the best of them, and worked the herd with single minded mare precision. All the horses behaved when she commanded them to. Her love of children was endless, she passed and so did my aged stallion, they died of lepto, I buried them with love and flowers in my pasture, no other option in my mind. I have trained my whole life, I have skills that shock myself everyday, because I ask the questions and let the horses fill in the blanks-I get more responsiveness with less persuasion so I get angry when these poor horses are thrown out like garbage cause they don’t respond to abuse. If it was up to me they would just own empty halters, and i’d retrain the world! It’s the people not the horse, my quote is they have a programming error, so if the people don’t the know the program they blame the horses for the error’s. So re-boot and start over, just leave slaughter out as an option! Thanks for listening! trust me the horse’s have heard all about this. The horse world is lucky to have you as a member, Cynthia. Bless you. Spoken like a true horsewoman. We need more people like you. Thank you for this heartfelt prospective and information. Cynthia, thank you for this useful information. I believe in the horse as companion and friend. Bravo Cynthia! I feel three same as you. Thank God you are here for the horses! I have a sickening thought; a realization that those in the horseauction, transport to slaughter, and slaughter all knew the meat was being used to “cut” other more expensive meats. All the talk of it not tasting much different than other meats – could be I’m just sick and tired of trying to see the good in the horse slaughter people. It is time, way past time – to cut the umbilical cord and force those damned people to find another way t make a living … and in the meantime, hire more police and law enforcement cause we know they will not change their ways. Useful information. Thanks RT and all who contributed to this. Great article. Great comments. Thank you and shared. This is one business that I truly hope everyone attached to it goes bankrupt. From buyers, auction houses, slaughter houses and EVERY politician that has come out in support of this nasty, nasty business. I hope they ALL end up as bag people on a cold street corner. Thanks again Cynthia for all your comments, especially the story about the horse you saved. I too saved an Arabian gelding who was one day away from being sent to a Kill buyer. He was in my barn, but he was wild and the owner hardly ever came out to see him. He would pin his ears back if people looked into his stall. If someone opened the door, he would rush the door. My horse at the time was 32 and his health was beginning to fail. I knew it was just a matter of time. I guess the Holy Spirit brought me to this horse. I never imagined owning this horse. When the owner owed everyone – 4 months back board, the shoer and the vet. It was apparent that time was running out for this beautiful horse. One evening when I was at the barn, I passed by his stall. This night was totally different. He came to the front of the stall and I looked into his heart right down to his soul. It was as if he knew his fate. I told the gal at my barn to call the owner and ask her if I could work with him. In the mean time, I had scheduled a Reiki session for my elderly to see if I could make him comfortable. He passed before the session. I then decided to allow this very sad and frustrated horse to use the session. It was amazing as he shared so much of his life with this lady. I was able to video tape the session so I could refer to some of the comments. It was during this session that I knew I must save the horse. The next day I called the owner and asked about buying him. I bought him for all the back bills. It appeared that had I not called her, he would have been picked up the next day. I have owned him for a few years now and my vet is amazed at the transformation. There are no bad horses only owned by people who do not understand them. I used this information from the session to follow up on his past. It was amazing to find all of what he relayed to her was true. He was bred as a show horse, taken from his mom at very young age and the sadness went on. I later found that he was the son of a very famous Arabian stallion who had many US Championships as well as 3 or 4 Canadian Championships. It didn’t matter to me who he was. Sorry for going on and on. This is the story of only one, but I’m sure that there are many many more. We can never allow slaughter in the US again. I think the Appaloosa breeders are among the smartest. They realize the value of their horses. Some of the other breeds use slaughter as a way to cull their herds. Perhaps all the problems which arose with the horse meat will cause this business to crash and burn to the ground. I too feel its about time these people find alternate employment.